Lately I'll browse this book at least once a day to decide on what to have for dinner/ lunch. 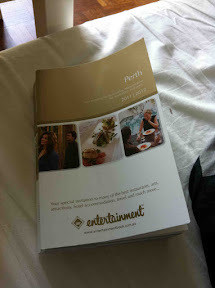 The entertainment book provides discount vouchers not only for food but also on neighbourhood activities. My best buy so far in Perth. Provides me not only with the local guides in Perth, but also tonnes of savings when eating out!